According to Lars Pasedag, Krone Product Manager, its has been a very good year for silage wagon sales, and 2010 is set to be even better with a completely new range of Krone silage wagons, available from Kubota Tractor Australia . The new line up of silage wagons includes three models, with the new AX280 GD (28m³ to DIN standard = 48m³ hay volume) being the ideal machine for dairy farms as it is equipped with a standard cross conveyor to feed out fresh material to the animals. The new MX350 GL/GD wagon (35m³ to DIN = 56m³ hay volume) and the ZX450 GL/GD (43m³ to DIN =66m³ hay volume) are the ideal machines for larger operations and contracting businesses. These machines have high loading and unloading rates for chopped grass and maize silage. All AX and MX silage wagons feature a camless low maintenance pick up. This pick up runs 30% faster to improve crop flow and forward speeds and has 65% less moving parts than conventional pick ups that use a cam track. 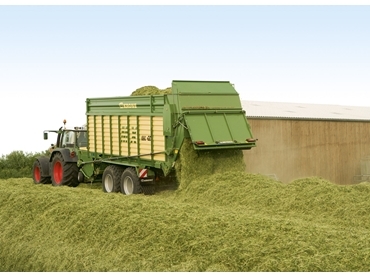 Pick up width for AX is 1700mm and 1900mm for the MX silage wagon. Krone have also designed some impressive innovations in rotors and cutting systems. The 760mm diameter feeding and cut rotor with 6 rows of tines in the AX model and the 880mm feeding and cut rotor with 8 rows of tines in the MX machines, allow for an enormous throughput. The tines welded to the rotor are surfaced with hardwearing “Hardox” plates. The chain and slat floor of these wagons is angled down towards the rotor for a shortened travel of the crop inside the wagon. This lowers the horsepower requirement and fuel consumption to run the wagon, while also making for a better stack inside the wagon as the first portion leans towards the front loading wall, instead of falling over to the rear. The full loading capacity will be used as a result of the angled floor. A theoretical cutting length of 45mm is achieved via the 32 knives in the AX280GD, while the MX features 41 knives in a spacing of 37mm. The knife bank on both machines folds down and swings out to the side. The operator no longer walks around the machine to lock and unlock the bank on either side and then remove the knives under the machine. Instead, he carries out all operations on the left side of the machine. To swing out the knife bank, he simply operates a lever that unlocks the knife bank and then swings it out to the left for fast knife changes without tools. The AX280GD and MX350GD silage wagons also feature two standard rollers, with a third roller available as an optional extra. These 470mm diameter, octagonally profiled rollers operate on a new principle, whereby the bottom roller spins at a faster speed than the top roller, thus providing a smooth discharge of crop without blockage. The AX280GD is equipped with a cross conveyor to directly feed fresh material out to animals. The MX350GL comes without the discharge rollers to dump the material quickly into the silage pit. All silage wagons feature a standard boogie axle with rear axle steering, which is automatically locked for safety when the unit is driven over the silage pit. An easy to understand comfort control monitor is used to operate the wagon. The onboard diagnostic system, allows the operator to check the electric and hydraulic system for malfunctions without the need for dealer assistance.